Garner Customs & Restorations, LLC specializes in Concours body-off frame nut and bolt restorations. We consult an exclusive group of experts, each in their own field of expertise on specific make/models. We will carefully disassemble and inventory every piece and part of your vehicle and remove the body from the frame. The body will be installed on a rotisserie and media blasted to evaluate the condition of the body panels. Every nut and bolt on your car will be inspected for condition and correctness. We will match factory specifications on period correct parts, platings and finishes. We will replicate all specific decals and markings per original factory specifications. 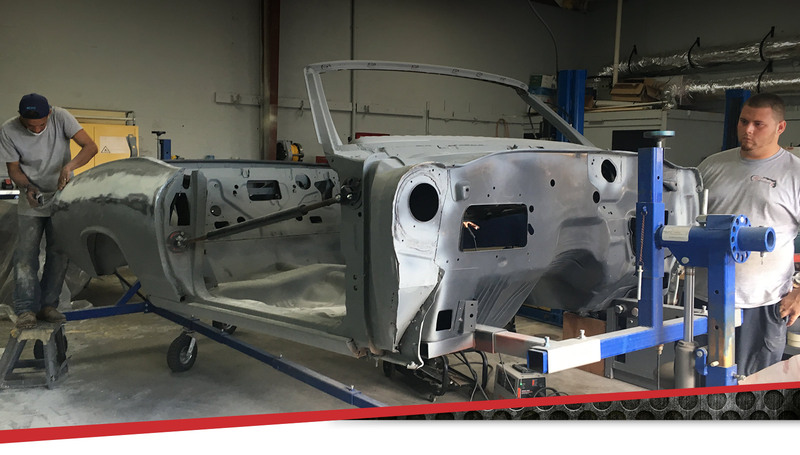 We will perform all metal work and body work with care and precision with the goal to use the smallest amount of body finishing filler as possible. We will use only the most qualified parts suppliers and vendors to reproduce your dream car as it came from the factory showroom. GCR has garnered awards in national car shows including Concours Gold and Best In Show. Contact us for specific details on how to approach the rebuild of your dream car. Not every classic vehicle is desired or made to be restored to concours levels. A driver quality vehicle done to your level can allow you to drive your classic without guilt and still present well at local car shows and cruises. GCR will work with you in achieving the level of restoration that you desire at a budget that is agreed-upon before work is started. Garner Customs & Restorations will provide the knowledge, experience and patience required to modify or customize your classic cars to achieve the end result that you pictured in your imagination. Many customers now express a lot of interest in building Restomods. The beauty of a Restomod is in retaining the beautiful classic look of a vintage car, but with modern handling and performance. We consult and use only qualified vendors to supply a bevy of modern components such as Engine, Suspension, Steering, Wiring, Gauges and Interior upgrades. We can make your classic perform like a modern car with the reliability that comes with modern components. Garner Customs & Restorations can provide body and mechanical repairs in the unfortunate event that your classic car is involved in an incident. We will painstakingly paint match and seamlessly repair your vehicle so that you will not be able to see where any damage has occurred. We also provide assembly and repair services in the unfortunate event that your pride and joy has been floundering in a subpar shop. All too often unscrupulous restoration shops hold an owner’s dream car for years without properly finishing the work. If your car has been held in garage jail or if you have performed most of the restoration yourself and need someone to finish it please contact GCR to discuss how we can get your baby back on the road like it deserves. Garner Customs & Restorations can help you find and restore the make and model classic car of your dreams. If you’ve always desired a specific model and year of classic car we can track down and purchase a good starting vehicle for your project. Based on your budget and your level of restoration, we will bring your new vehicle up to the standard that you demand.